The night we met, we hardly spoke. Not much more was said except, "hello", but that night I told my best friend, "That's the man I am going to marry!" She, along with most everyone else, told me I was crazy and laughed it off. You finished your second tour in Iraq, and shortly after you returned we were married! That first year was good. We had a great relationship. We were always spending time together, whether it was watching movies, going to ballgames, taking walks, going out to dinner... We enjoyed each others company so much. Due to an injury in Iraq, you had surgery and received a medical discharge from the army. We returned to civilian life, but after a few short weeks, it was very evident that you were not the same man I married. The man I married was happy, compassionate, thoughtful, caring, fun, the list goes on. Over the course of a few weeks, you became a man I did not even know. Paranoid, depressed, angry and short-tempered, withdrawn, that list goes on, too. There were days at a time you would not even speak to me or even look my way. You sat there, an empty shell of the man I once knew. Many times I wanted to give up, but I knew something was wrong with you. I knew I had to figure out why my wonderful husband had turned into someone I didn't even recognize. After much research, I started learning about PTSD. That started our journey of the healing process. I was, and still am, determined to help you in every possible way. You are a true soldier. The battle you have been fighting for the last 5 years shows how brave and dedicated you are. We have had some very good times in our marriage, but also some VERY difficult times. There have been many days that I dropped to my knees and said"Lord, I can't take this anymore." And each time that thought runs through my head, I'm reminded of His promise to never put on me more than I can handle. I also know that I vowed to love you in sickness or health, and for better or worse. I vowed to you to love you until death do us part, and that's still my promise today. So we forged on, refusing to give up. You are such a strong man. Going through years of counseling, even though it's very uncomfortable at times, and being on many different medications and lots of medication adjustments I know has been really hard. But you still keep on, because you know you have a wife and children who love you and depend on you to be there. It took a few months to get the diagnosis of PTSD, but it was great to have a name to put with all the symptoms you had been experiencing. I was scared to death though. I had read a lot about PTSD, and I knew that this was not going to be an easy fix. PTSD had taken my husband from me, and my children's father from them. I was scared and upset. I thought I was going to have to raise our kids without you. But you chose to fight this fight head on, and never turn back! Since you started treatment, you have made so much progress, and I am so proud of you. You amaze me with your determination and courage to beat this. I know PTSD will never just go away. But you are learning to deal with it and go on with life. You are an amazing father and your kids adore you. You are a wonderful husband, and I never doubt your love for me. We have been through many ups and downs, and times of great uncertainty. But we will not give up. Though it's been hard at times, this journey has made our marriage so much stronger than it was before. For a time, you were very"disconnected" from everyone and everything. That's just another symptom of this disorder. But since learning how to cope, you have opened up to me more than I ever thought you would. We have such a comfort in each other now that we didn't have before. We have a closeness that no one else could understand. As a couple, we have grown so much through all this. And for that I'm thankful. I'm so proud of you, and I am proud to be your wife. I love to hear you laugh and see you smile again. I missed that for so long. I'm so fortunate to have a husband who loves us enough to face the hard stuff and be determined to overcome it. You are a true American soldier- going forward even though it may be difficult. Someone once said,"We are not the same persons this year as last; nor are those we love. It is a happy chance if we, changing, continue to love a changed person" We are not the same as we were, but we keep learning as we go, and it truly is a happy moment when we continue loving through so much change. I love you. I'm proud of you. I'm here for you, and always will be. I Love You and Happy Valentines Day! 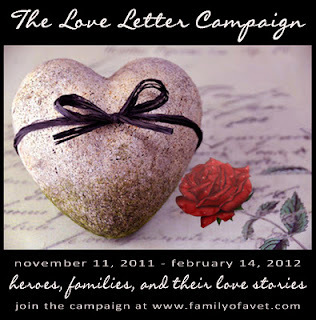 This blog post is part of The Love Letter Campaign... a project started by FamilyOfaVet.com to encourage those who love a hero to write a letter sharing their story (where they started, what they've faced together, and why their love endures). It's not just for spouses, but also for parents, siblings, caregivers, and friends. It's about telling the "rest" of our stories... stories that continue despite PTSD, TBI, and the challenges of life after combat. To share your love letter or find out more about the campaign, visithttp://www.familyofavet.com/love_letters.html. This how love begins. Thanks for this lovable post.